ExpenseIn uses real-time exchange rates. If you have added your own rates, we will always use these rates over the real-time exchange rates. 1. From Admin, click Exchange Rates. 2. 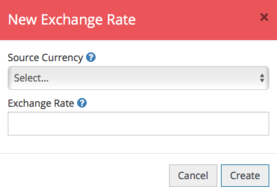 Click the New Exchange Rate button. 3. Select the source currency that you wish to add an exchange rate for. 4. Enter the rate of exchange. Once you're happy, click Create to add that exchange rate to your account.